For an exchange as large and as influential as bitFlyer, you would be surprised how little information there is on anything related to the service provided, including information on fees, the Bitcoin price, is bitFlyer safe or not, the bitFlyer app, or anything else about the exchange. Sure, bitFlyer is first and foremost a Japanese exchange, based in Tokyo and focused on providing cryptocurrency trading services to Japanese customers. Be that as it may, this exchange has recently reached out and opened up shop both in Europe and the US, which means that there are now many cryptocurrency enthusiasts out there looking for a well-written bitFlyer review. That’s where we come in. In our bitFlyer review, we will include official and fact-checked information directly from the source, as well as a number of unbiased and objective perspectives and facts provided by various users and experts who have relied on this exchange for a long time. But enough of “we’ll do this”, “we’ll present you with that”, it’s time to get down to the nitty-gritty. Are you with us? Welcome to the first step on our “bitFlyer review” journey. Before we get to the super-crucial, mega-important stuff like the bitFlyer fees or safety, it’s time to talk about what makes bitFlyer even worth talking about. 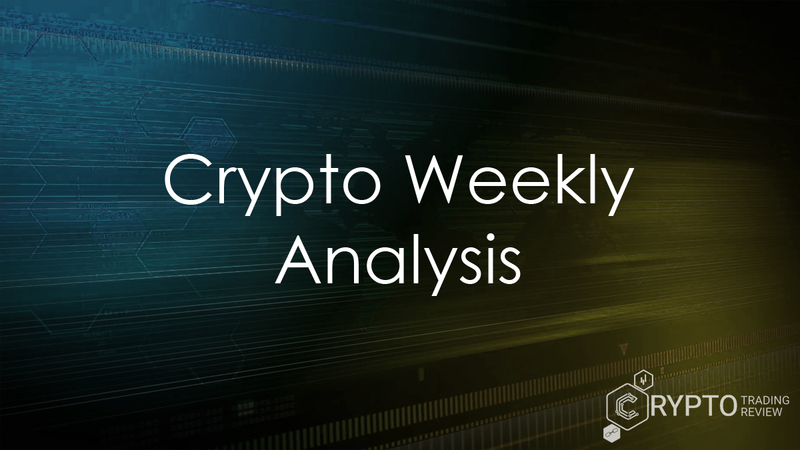 These talking points, covering everything from a bit of history to company’s crypto credentials, are actually just as important as various facts and statistics, since they let you know what kind of company you are dealing with. Most users will happily pay slightly higher fees or choose an exchange that doesn’t have an app, as long as it is reliable, with a proven track record and run by passionate, dedicated people. So, what can be said of bitFlyer? Is it reliable, does it have a proven track record and is it run by passionate, dedicated people? Although the bitFlyer exchange is relatively new in Europe and the US, it has long been one of the most popular and most visited cryptocurrency exchanges not only in Japan, but in the Far East in general. Apart from that, if you are monitoring websites that rank cryptocurrency exchanges by volume, you must have noticed that this one is consistently ranked near the very top, often taking up the number 1 spot. One of the things that stand out the most when it comes to bitFlyer, however, is just how much the folks at the company like to play by the rules. Even though cryptocurrencies are supposed to be decentralized and the aim of most cryptocurrencies is to transcend borders, the truth is that, in reality, we are in a political, divided world – a world that has a lot of laws that were made before cryptocurrencies became a thing. And you may disagree with these laws, but you still must obey them. That is why bitFlyer was one of the first cryptocurrency exchanges in Japan to receive an official license issued by the Financial Services Agency (FSA) of Japan. In addition to that, it has close to 1 million users, which is a huge thing considering its stake in the BTC/JPY market. The trade between Bitcoin and the Japanese Yen accounts for approximately 60% of total BTC trading volume. If all of that isn’t enough to paint a picture of just how serious this exchange is, let’s just say that among the companies that invested in bitFlyer you will find such big names as Mitsubishi UFJ Capital, the Mizuho Financial Group and the Digital Currency Group – all of which care about both their projects and their reputation, while the latter is particularly famous for financing a large number of successful cryptocurrency startups worldwide. Although the biggest trading pair on the exchange is the BTC/JPY pair by far, the BTC/USD pair is slowly catching up and is already very respectable. In addition, you can trade both Ether and Bitcoin Cash, with support for Litecoin, Ethereum Classic and other altcoins planned for release somewhere during the first half of 2018. In the next section of our bitFlyer review, we’ll talk a bit more about bitFlyer in the United States and Europe, so, if you are a user outside Japan, you may want to pay close attention. The bitFlyer exchange became available in the US in late November of last year. Although it is not originally a US exchange, it became only the fourth cryptocurrency exchange to receive the controversial BitLicense, which is necessary to operate in the state of New York and which forced out a number of other exchanges, including ShapeShift. bitFlyer also applied and received operating licenses in more than 40 other states, going the extra mile to do everything through legal channels, even when there were no such prerequisites defined by existing state laws. It took another couple of months before the exchange came to Europe. There, it launched on January 23, 2018. Just like in the US, bitFlyer first obtained an official license to operate in the European Union. The exchange chose Luxembourg as its European base of operations. It currently supports trading BTC and EUR, with additional coins planned for release in the near future. 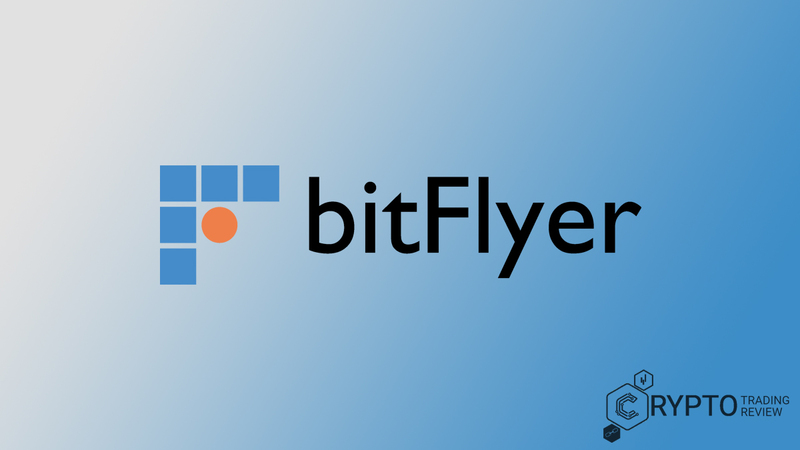 The company received a Payment Institution (PI) license from Commission de Surveillance du Secteur Financier (CSSF), a Luxembourg regulatory body, meaning that now bitFlyer has a legal license to operate on three continents. With so many governments recognizing the company, many have called the company the “most compliant” crypto exchange in the world. By the end of 2017, when Bitcoin was at its peak, bitFlyer was the third biggest Bitcoin exchange by volume. Now, when Bitcoin has lost a lot of its December glory, the exchange is looking to find a footing in Europe by initially focusing on professional, high-volume traders, which don’t have a lot of exchanges catering specifically to their needs. Since a lot of you might be a little impatient, let’s hope everything we’ve said so far will do as far as introductions are concerned. In the upcoming section of our bitFlyer review, we’ll be talking about setting up a bitFlyer account. Is it complicated? What kind of information are you expected to provide? We’ve got the answers – find out below. All right, how does one set up an account here? It is relatively simple. First, go to their website. When you access the signup page, you are given a choice between an individual account and a corporate account. There are several signup options. For example, you can use your email address, your Facebook account, your Google account, or your Yahoo account. Before the signup process is complete, bitFlyer will send you a keyword to your email address for verification. Like with other exchanges, there are several verification stages. Providing more information allows users to access more advanced features. To unlock all of bitFlyer’s features, users are expected to submit proof of their identity, such as a scan of a government-issued ID. Other info that users may have to submit at a certain point include their name, address, and date of birth. In case users register with their address, they may sometimes receive mail from the company. For bank transfers, users will have to link their account with a verified bank account. To make sure all of this information stays safe, the company has introduced two factor authentication. The easiest way to do this is by using Google authenticator. Users can sync their trading account with Google authenticator by scanning the account’s QR code. In the upcoming section, we’ll be going over the two account options available to users, which is definitely a part of this bitFlyer review you don’t want to miss! For beginners, newcomers to cryptocurrency trading and users who just want to test things out, bitFlyer has an account type called the Wallet Class. For more advanced users, Trade Class is definitely the better option. In this section we will be providing an overview of various features for each class. Let’s start with the Wallet Class. 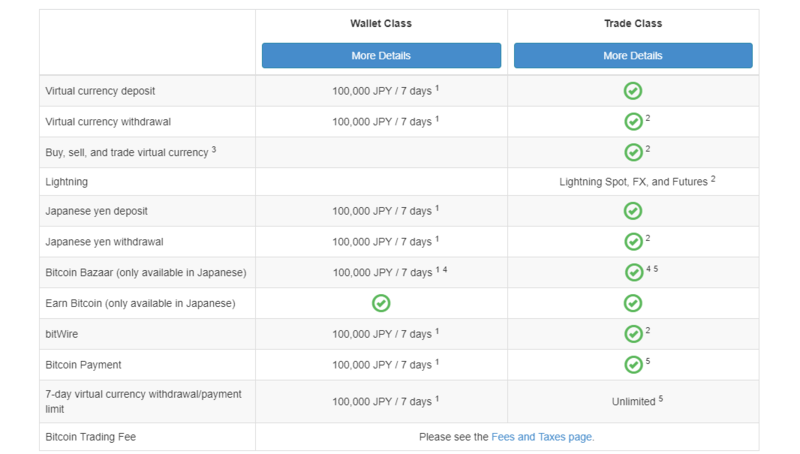 The Wallet Class also has a 7-day cryptocurrency deposit and withdrawal limit – equal to 100,000 JPY. To access trading, you will have to upgrade your account. For individual accounts, if you want to upgrade your account to Trade Class, you will need to provide various personal information, including a document that proves your identity. For corporate accounts, users will need to provide detailed information regarding the company, specify who the UBO is, and present a certificate of corporate registration. In Trade Class, you can access all of the services from the Wallet Class, as well as being able to trade on bitFlyer’s Bitcoin and altcoin markets, and buy and sell cryptocurrencies in exchange for fiat currencies. Also, Trade Class has no account limits when it comes to deposits, withdrawals, or trading. Since cryptocurrency trading is likely the main reason why you are reading this review, stick around for the next section, where we’ll focus on bitFlyer’s trading platform, including a tutorial on how to use it. 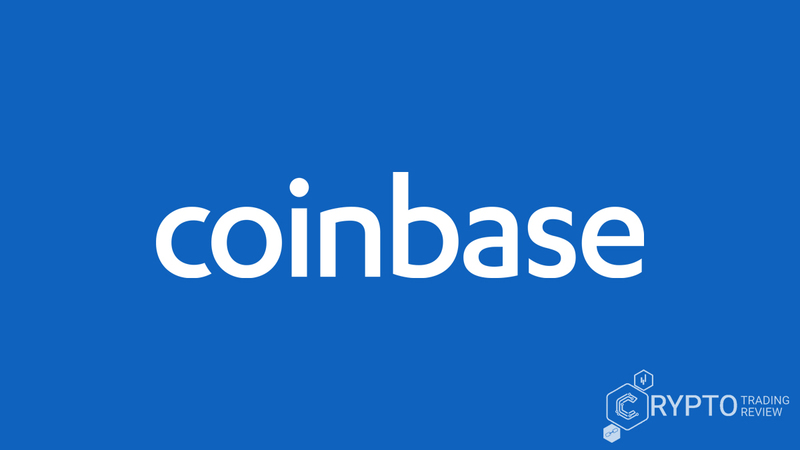 Apart from the question “Is bitFlyer safe?” and concerns regarding the fees and the bitFlyer Bitcoin price, this is probably the most important part of our review and the one we expect our readers to focus on the most. Is the exchange easy to use and how do you buy and sell cryptocurrencies using the trading platform? Bitcoin and other cryptocurrencies can be traded for fiat currencies based on your location. For Japan, it is the Japanese Yen, the US dollar for the US, and the Euro for the EU. When you wish to trade, simply select the amount of coins you wish to purchase or sell. The platform provides an overview of crypto prices in real time. You can also view a graph which traces the price of Bitcoin over a certain time – days, weeks or months. If you are interested in recent transactions, you can access bitFlyer’s trade report, in addition to checking out the order history, which is easily accessible. The great thing is, the exchange accepts credit cards for purchases, which makes buying cryptocurrencies with fiat currencies so much easier. But where do you access these features and how easy is it to navigate? Once you log into your bitFlyer account, you will see a tab titled “Bitcoin Exchange” on the left side of your account’s home page. If you click that tab, you will open up bitFlyer’s trading platform, where you can buy and sell cryptocurrencies. If you check out the left side of your screen, you will see a live feed of all the recent purchases on the exchange. This is useful, since it lets you see all of the latest prices, as well as trade volume. For each transaction displayed, some other details include the amount of crypto that was bought/sold, the total price, as well as the precise time of the transaction. When you are still in the exchange platform, check out the bottom of the screen. You will see two buttons: BUY and SELL. If you’re ready to start trading, all you need to do is enter the amount, specify the price you’re looking to buy/sell for, and click on the appropriate button. bitFlyer also has the option of Margin and Futures trading. For Margin trading, the rate is 100% for 1x leverage, while 15x leverage will secure you a 6.67% Margin rate. These features, however, are among the more advanced features provided by the company. Other similar options can be accessed through bitFlyer Lightning, bitFlyer’s exchange for professionals. If you want to know more about that, stay tuned for the next part of our bitFlyer review! You must be thinking, if bitFlyer Lightning is a pro exchange, then the account creation process must be way more complex – or perhaps you need special licenses and documents. That is not the case. Creating a Lightning account is just as simple and straightforward as creating a regular account. First, you will need to provide a valid email address. The personal information required for creating a bitFlyer Lightning account includes your full name, address and phone number. Before trading, you will have to make a deposit – you can use any of the regular channels. When you access the exchange Lightning platform, the first thing you will notice is how much it feels like a forex trading platform (if you are familiar with that). The platform is intuitive and it is obvious that it was created to cater towards experienced traders. When you access the platform, on the left-hand side you will be able to see a very informative chart with several indicators. You can switch between different charts and study them more closely in full-screen mode. Your main focus, however, will be on the order book, which is why it is located smack dab in the middle of the screen. The design of the platform is very modern, yet functional. The default colors are orange and black (background). We like the color scheme, but in case you don’t, you can play with the colors and create a UI which is a bit more in line with your tastes. The platform also plays sounds with each transaction and every time a new order appears in the order book. These sounds are a great addition, since they allow you to focus on something else, with bitFlyer opened in a separate tab, ready to notify you whenever something interesting happens. That way, you will never miss anything, and yet you don’t have to stare at the screen all the time. If you’re not a fan of the sounds, you can simply turn them off. In the next part or our bitFlyer review, we’ll be giving an in-depth rundown of the features of bitFlyer Lightning. This information is crucial, since it lets you know how to get the most out of the bitFlyer exchange! 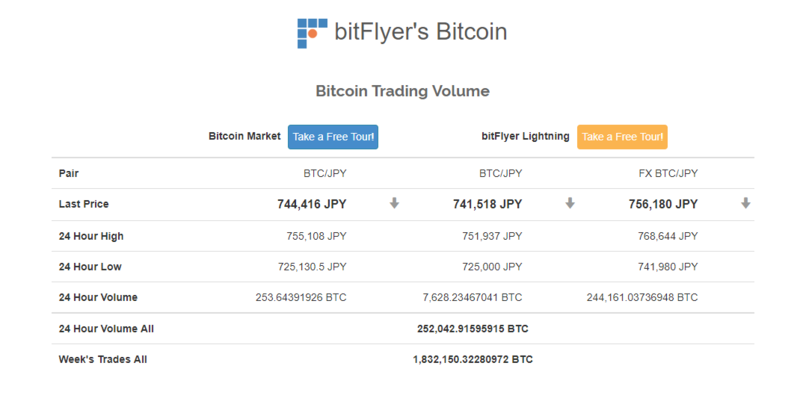 If you access bitFlyer’s official website, you can access the demo version of bitFlyer Lightning. In a guided tutorial, the website takes you through the various options and features and explains every single part of the trading window. We have to congratulate bitFlyer’s team on their efforts, since this is rarely provided by other exchanges, and it certainly makes it easier to master their platform. Above the chart on the left-hand side, you can click on different tabs to switch between markets. The menu is on the far left. It lets you see your trade and transaction reports. Additionally, you can access the deposits/withdrawals window from there and view your profits/losses history. The big chart on the left-hand side provides info on opening and closing prices, as well as minimum and maximum prices reached. Among available indicators, we feel like we should point out volatility. The order book is simple. It is divided into two visually easily distinguishable parts. The top half has red numbers, while the bottom half has yellow numbers. The red numbers in the top half represent orders – one line for each order. The size of the order is displayed first (to the left), while the price is in the middle of the line. The yellow numbers in the bottom half of the order book are bids – one line for each bid. Once again, the price is in the middle of the line, but the bid sizes are on the right-hand size. Between the two parts of the order book (top-orders, bottom-bids), you can see the last traded price and the spread. The last price is in the middle. The spread is to the right. It represents the ratio between the best bid and the best order. It is displayed as a percentage (usually around 0.06% – 0.30%). Right next to the order book, to the right, you can access your order screen. Here you can join in on the fun and make a bid or place an order. There are three tabs on top of the order screen, allowing you to switch between limit, market, and special offers. Also in the order screen, you can designate the amount you want to sell or buy. Below, you can see the estimated cost in USD or other fiat currency and the fee (for an overview of bitFlyer fees, see below). At the very bottom of the order screen, there are two big, obvious BUY and SELL buttons. After designating the amount and the price, all you have to do is press one of those buttons. Directly above your personal order screen, you can see your profits and your losses. All markets are taken into account. Once you place a new order/bid, you can see your open orders on the bottom left of the trading screen, directly below the big chart. The screen with the open orders is like a table, with information on date, order type, size and price. You can compare your price to the average price and see how many coins you’ll have remaining after the order goes through under “Remaining”. You can cancel an order by clicking the X button next to the order. Very convenient! On the far right, you can see a list of all orders traded on the market – in red, yellow and white. The bottom middle of the screen displays all of your completed orders, under “Execution History”. You can interact with other traders in real time by accessing the chatroom on the bottom right-hand side of the trading platform. That is more or less everything there is to say about lighting. We did promise that we would dedicate a section of our review to bitFlyer fees, so we’ll be moving on to that. Stay with us! When it comes to bitFlyer fees, already at first glance it is clear that the fees are among the lowest fees on the cryptocurrency market, which may explain why the exchange is so popular. There are some things that you need to keep in mind when it comes to bitFlyer fees, however. There are many exchanges that only charge a “taker” fee, while market “makers” are not expected to pay a fee. With this exchange, it is different. Here, there are both fees for “makers” and “takers”. As a consequence, bitFlyer’s “taker” fees are much lower than elsewhere – the fees are split between the two sides. Even with that in mind, when we add up the “maker” and the “taker” fee, the sum is still lower than “taker” fees on many other exchanges that do not charge a “maker” fee. For exchanging BTC and fiat currencies, the maximum fee is 0,15% for low volume traders. As your trade volume increases, the fees drop steeply. The highest fee is 0.20 %, for the BTC/ETH trading pair. For making deposits via bank transfers (wire deposits), there are no bitFlyer fees. 100% free, both in the US (Fed wire) and in the EU (SEPA deposits). To make a withdrawal in fiat currencies, in the US you will have to pay a $10 fee, while in the EU, the fee is much lower – only €0.30 for withdrawals ≤ €250,000.00 (the majority of users). For high rollers who make withdrawals exceeding €250,000.00, the fee is higher – €10.00. There are no fees associated with account creation or maintenance. To deposit or withdraw BTC, you need to pay a fee of 0.0008 BTC. Another thing about bitFlyer is that it often has special offers and discounts. 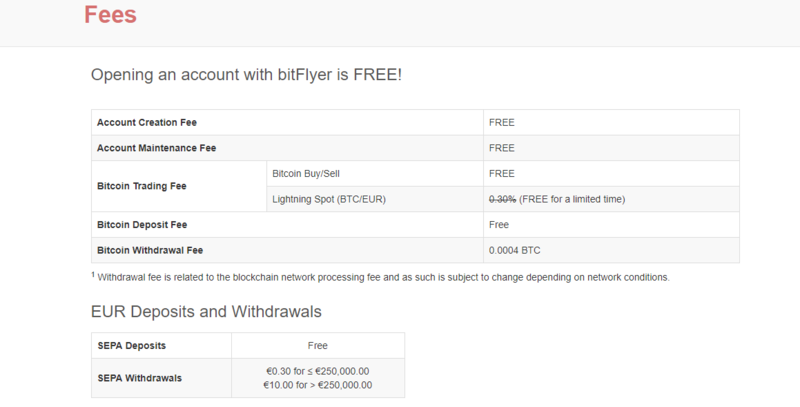 For example, for two months after bitFlyer launched its services for the US/EU markets, there were no fees for users from those markets. In the upcoming section, we’ll be answering the question, “Is bitFlyer safe?”, a crucial part of this review. Safety comes first, after all. The first thing you have to know about the company is that this exchange does everything by the book. bitFlyer has obtained operating licenses in Japan, the United States and the EU, which is why several independent publications have named it the world’s most compliant cryptocurrency exchange. What does this mean? It means that bitFlyer is least likely to get in trouble with the law – meaning it will never get banned. Since it has been approved by so many different governments, you can be 100% sure that its reputation is impeccable. 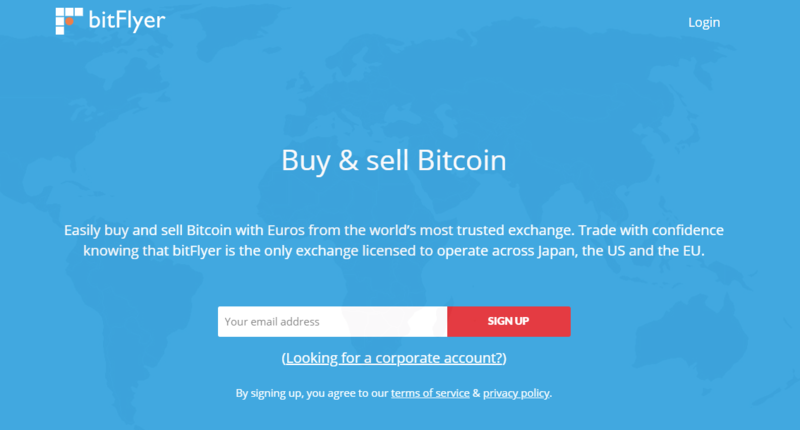 Also, bitFlyer follows very strict, user-oriented guidelines. You will never, ever get scammed, which is not something you can know for sure when you take your chances with many other exchanges. Besides, with your assets on bitFlyer, you can rest easy – they will never be blocked, seized or taken away. Compliance with Know Your Customer (KYC) and Anti- Money Laundering (AML) guidelines. The company offers its services to genuine customers, with no room for error. You can be sure that the person you are trading and chatting with when you are using the bitFlyer exchange is not a hacker or a scammer of any kind. It uses Multisig – which means that all transactions are approved by several users before they go through. 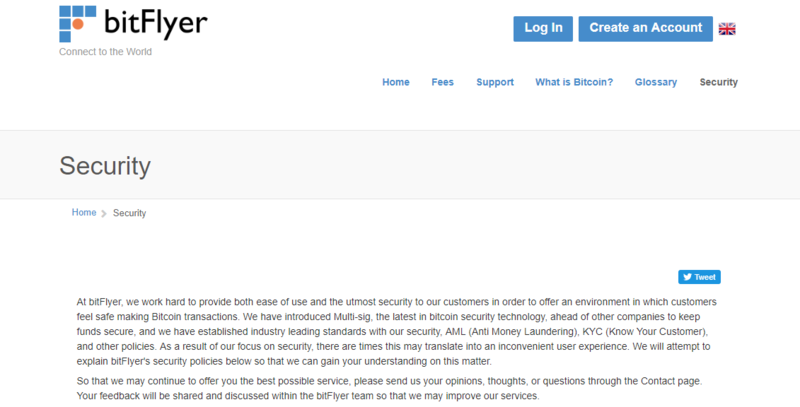 bitFlyer’ s servers are protected against attacks by an advanced Web Application Firewall (WAF). All communications are encrypted using SSL encryption. 80% of all cryptocurrencies are stored offline in cold storage, with only 20% in hot wallets for immediate trading. As an additional safety measure, it has insured the property of its customers with a Japanese insurance company. All in all, is bitFlyer safe? Yes. Yes, it is. Want to also know if there is a bitFlyer app and what it does? Find out below. bitFlyer Wallet, available both for Android and iOS, is the official bitFlyer app. Despite its name, the app is not merely a cryptocurrency wallet, since it allows its users to access most of the features offered by bitFlyer’s desktop version. With bitFlyer Wallet, users can easily send, receive, exchange, and store cryptocurrencies using only their mobile phones. Sending crypto to other bitFlyer users by using social media accounts (e.g. Facebook) and email addresses. The bitFlyer app is well received, with a 4.2 rating on Apple’s App Store. User-submitted reviews mostly praise the app’s response time, its excellent usability, and its design. Some users did ask for more coins to be added, however, while some other users said that they would like a separate app for bitFlyer Lightning only. If you want to read the spectacular finale of the already spectacular bitFlyer review, stick around for another 100 words – we promise to keep it short. Enough idle talk, it’s time to get down to business. You want the pros and cons? No problem, here we go. All things considered, would we recommend bitFlyer? Come on, don’t be silly. You don’t need us to recommend bitFlyer at all. The exchange and its accomplishments speak for themselves. They have a great website, Lightning is probably the best pro exchange out there and they have licenses to operate on three different continents. They consistently take up the top spots on various websites that list exchanges by trade volume. You want reliable, you want safe, you want regulated? There is no better choice than bitFlyer, we guarantee it.